A Soto Zen Meditation Group in Ballymena, Northern Ireland. The practice of zazen, or sitting meditation, is available to people of all faiths and backgrounds. "All who come are welcomed - Those who leave are not pursued". We meet each Sunday at 7.15 pm (sharp) in St John Hall, 11a Corlea Gardens, Ballymena, BT43 7AR Near the Old Library. Please come a little early. Better act now to secure a place on Drumalis Zen Retreat with Ingen K. Breen from Friday 24 February 2012 17:00 until Sunday 26 February 15:00 Drumalis House, Larne, Co Antrim, Northern Ireland. A number of people still haven't confirmed so if you are one of them, contact Patricia and finally confirm or your place may be gone! Only one or two places left, so contact her now to make sure you are there! To book, contact Patricia, nezvaccaro@yahoo.co.uk, who will let you know if there are still places and how to secure your place. NOTE: There will be no sitting in St John House on Sunday 26 February because of the retreat. Normal services resumed the following Sunday. Drumalis Sesshin Friday 24 to Sunday 26 February. Ballymena Zen Group is hosting a Sesshin in Drumalis Retreat Centre in Larne on the weekend February 24 - 26 2012. Regristration will be available from 5.30 on Friday 24. It will be led by Ingen Breen, a dharma holder in the lineage of Zoketsu Fischer Norman and Shunryu Suzuuki. Places are limited and there will be approximately 25 rooms available which will be a mixture of single, twin and double rooms. The dharma is given freely, and payment is not compulsory. The viability of the sesshin depends on those who are willing and able to do so being offering donations. Meals and en suite accomodation will be provided. Suggested donation to cover costs, or support the practice of someone else who is attending is £120.00. If you want to attend e-mail Ballymenazen@yahoo.ie and we will send you a registration form. After looking at the forcase which is for below zero temperaturs and freezing fog, I have decided to cancel tonight's sititng. Going by the long range forceast we should be OK to have one on Boxing day. Hopefully Marty can give his precepts talk then. Any thoughts onthis let me know. Ballymena and Coleraine Zen groups are hosting a weekend sesshin (retreat) a Drumalis Retreat Centre from 6.00 pm on Friday February 25 until Sunday February 27. Accommodation will be full board in en suite rooms. Drumalis is a beautiful location - an historic and architecturally significant Irish country house set in its own grounds with a moderrn accomodation block recently added. It is disabled friendly. COSTS These events are run on a non profit basis and are to be regarded as a collective effort and commitment. A per head donation of £110 will cover our basic accommodation costs. Those who can afford to do so are invited to offer an additional dana donation to support the teacher, show our appreciation to the Drumalis staff and cover administration. £30-£50 for guidance. CONTACT places may run out and are limited by other bookings at Drumalis. Please register interest by e-mailing ballymenazen@yahoo.ie. A deposit of £50 will be requested later as we firm up numbers with Drumalis. Please indicate any special dietry needs. ZAZENKAI-Sunday 21 November. Normal Sitting off. The normal 7.15 sitting is cancelled for one week only on Sunday 21 November.Instead we have a full day's practice from 10.00 am until 4.00. 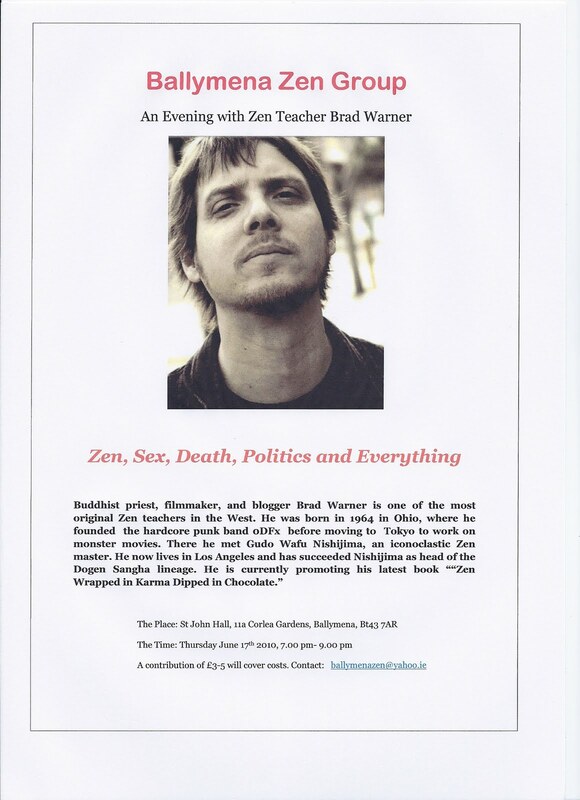 Ingen Breen, the zen teacher, will be leading the day during which he will give talks on the theme of Dharma. Those attending are asked to briong vegetarian lunch to share as well as zafus or benches and zabutons if they have them. The Zen teacher Ingen Breen will lead a day of zazen and teaching in St John Hall on Sunday August 8 for 10.00 am until 4.00pm. The Heart Sutra will provide the themes for talks. Drinks and some food will be provided but you can also bring some lunch to share. There is no compulsory charge but an average donation of about £20 will cover costs. Ingen is an old friend of Ballymena Zen Group and has been visiting us since our inaugeral meeting. Originally from Dublin, Ingen was ordained as a Zen priest after five years practice and study in San Francisco Zen Centre and at its monastry in Tassajara. He recieved dharma transmission from Norman Fischer Roshi in 2009. He is also a teacher of yoga and akido.